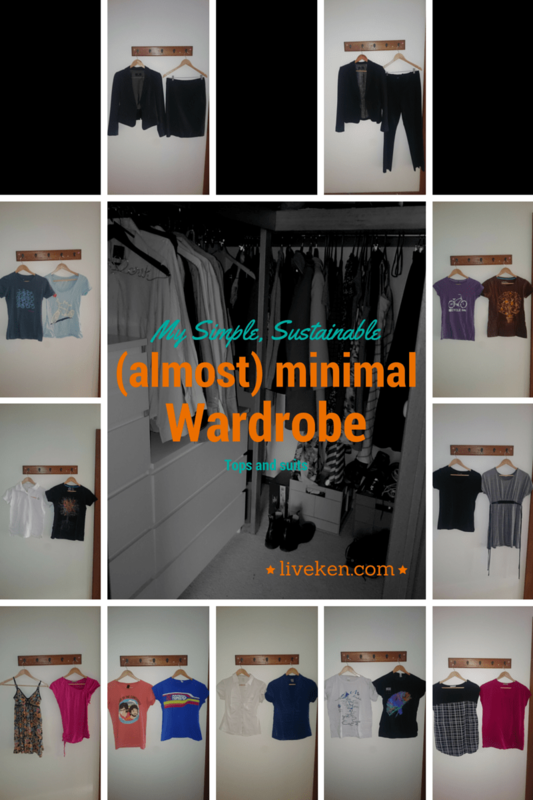 Over the last year or two I’ve been decluttering our house to help create a simple living environment. A big part of that has been reducing the amount of clothing and accessories I own to only those that I actually love, feel comfortable in, and enjoy wearing all the time. 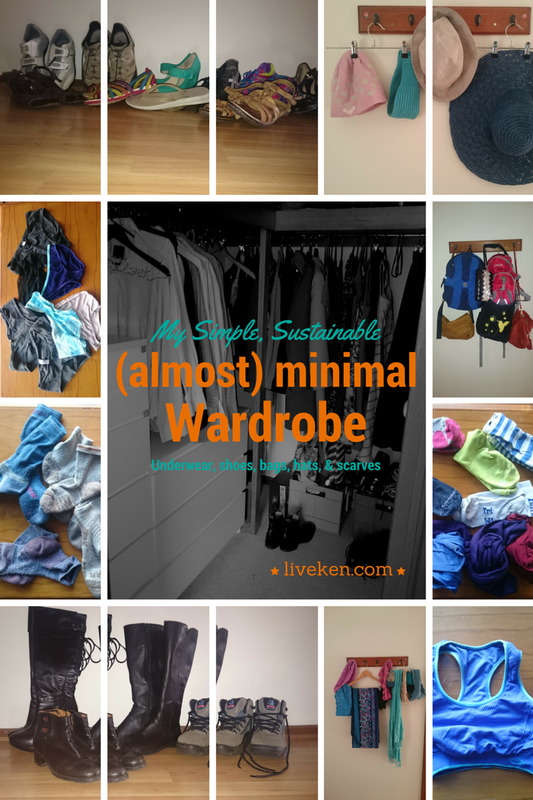 Janelle has previously shared a bit about her experience decluttering her wardrobe but today I’m going to take things a step further and actually show you exactly what I’ve kept in my wardrobe. 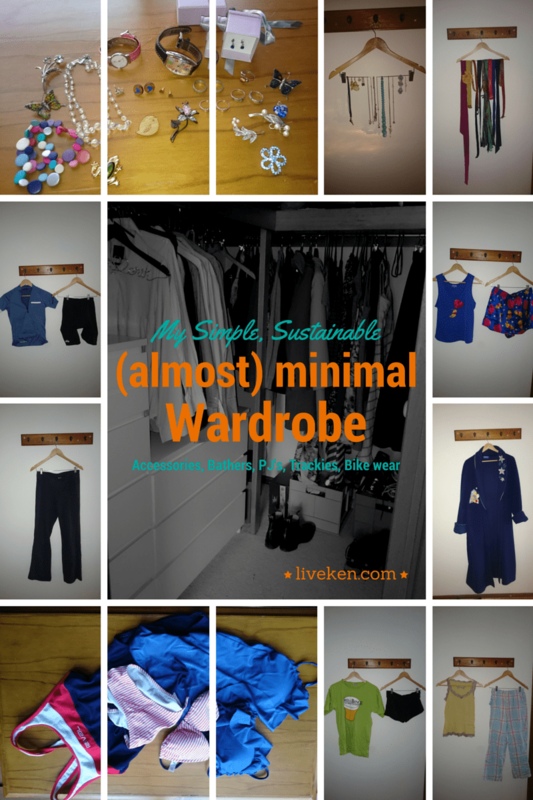 I’ve read a lot of blogs about sustainable fashion, capsule wardrobes, and minimalist wardrobes and have always found it fascinating to see what others have kept in their wardrobes. I haven’t taken the approach of minimising to a set number of items like Courtney at Project 333 and many others recommend, instead I’ve just slowly purged out anything that was too damaged/stained/worn out, didn’t fit me, wasn’t comfortable or wasn’t my style. I’m still slowly going through my tshirts (as they wear out I’ll be replacing a few with more neutral/versatile tops and just removing some of the others), and I still have way more dresses and jackets than I really need but I wear them all. So, without further ado, here’s my wardrobe as of today in pictures. I’ve included everything from socks and undies, to shoes and accessories, and everything in between. I only own one sports bra (which hasn’t been worn in over a year) because with my Fibromyalgia I haven’t found any others that are comfortable. Most the time I don’t wear one at all. My Winnie the Pooh PJ set were a Christmas present when I was about 11 or 12 so they’re almost 20 years old and still fit me (too big still). The green oversized t-shirt was my husband’s from the Uni pub crawl that was on my 18th birthday, I now use it as PJ’s. The two pairs of leggings may look the same but one is ankle length and the other 3/4 length. I don’t own many bottoms (and those I do own are either big on me or maternity) because anything tight around my waist is uncomfortable. For example my Jeans are actually these. As I mentioned before, I’m slowly moving away from band/concert t-shirts to more versatile tops that can be used with most my wardrobe. My go-to outfit, or uniform, is generally one of my dresses. In winter, I layer it with leggings, tops, boots and jackets. In summer, I pair it with sandals and a hat. And that is everything except my wedding and engagement rings, my garmin and my silver sleeper earrings which I wear all the time. I haven’t included hair accessories in here, but I only own one tortoiseshell bulldog clip, 2 hair ties, 3 different coloured flower clips and 3 different coloured beaded clips. That’s it. Although I’m aiming for a minimalist wardrobe for simplicity and sustainability, I’m not quite there yet but each and every piece in there is meaningful to me and plays a role in my life. 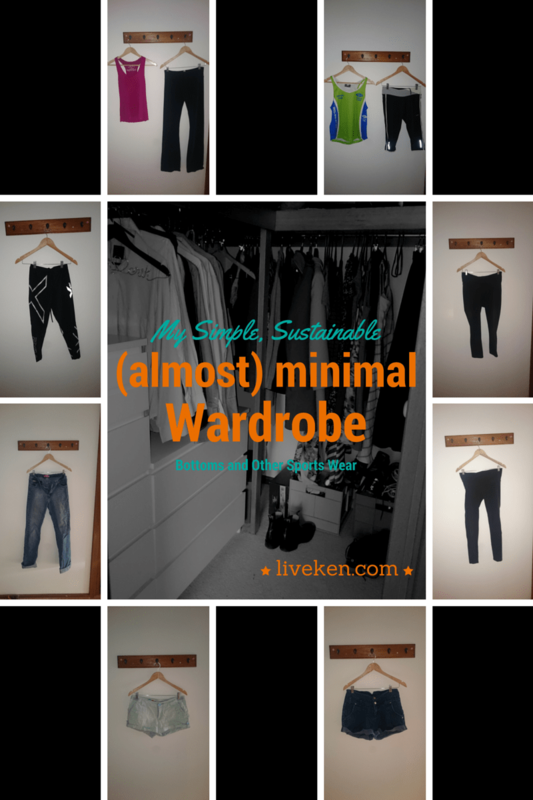 I’m currently participating in Summer Edwards 20 Day Sustainable Fashion Challenge which is providing useful insight into the best way to have a sustainable wardrobe. I’m also about to embark on a 12 month challenge (starting 1 July 2015) of not purchasing any clothing at all, including underwear. I had thought about starting at the beginning of this year but have recently had to purchase new underwear and have picked up one dress from an op shop in the last week (the grey cotton 3/4 sleeved one with pockets). I first heard about this challenge from Mrs Frugalwoods and was inspired to give it a go. So, starting 1 July 2015 I’m making a pledge to purchase no clothing at all for 12 months. I’ll keep you updated with how I go. 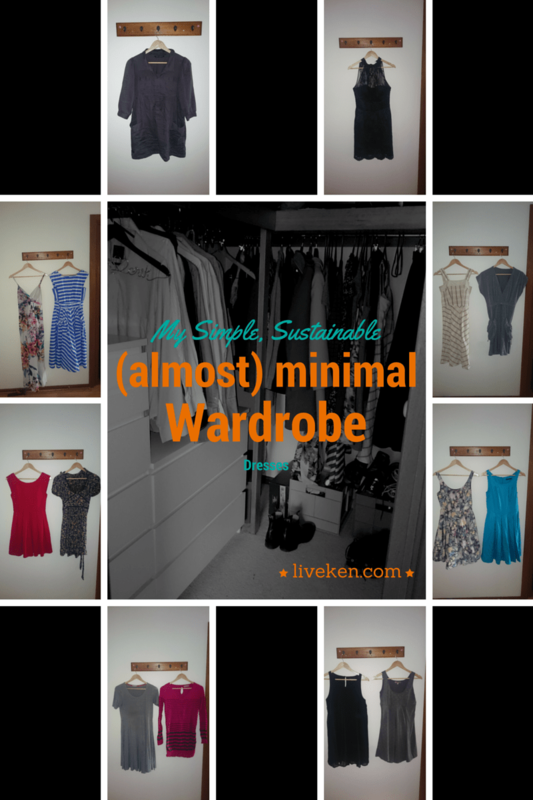 Do you have a simple, sustainable, meaningful wardrobe? 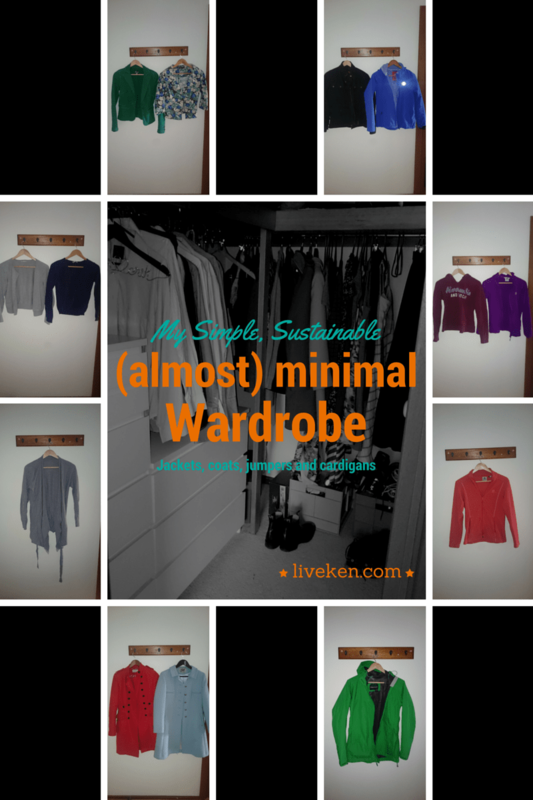 Would you consider doing a wardrobe challenge to help you determine what your simple, sustainable and meaningful wardrobe would be? Thanks for the feedback! The book sounds great, I’ll definitely keep my eye open for it. That’s awesome you’ll be doing the no-clothes-buying challenge!! I wish you all the very best :)!